Cork is one of those perpetually busy restaurants in Washington, DC, which is why I usually find myself at the bar simply enjoying a glass of wine and a tapa or two. Their small plates are really creative with the pairing of unexpected ingredients like orange with artichokes or mint with chickpeas. 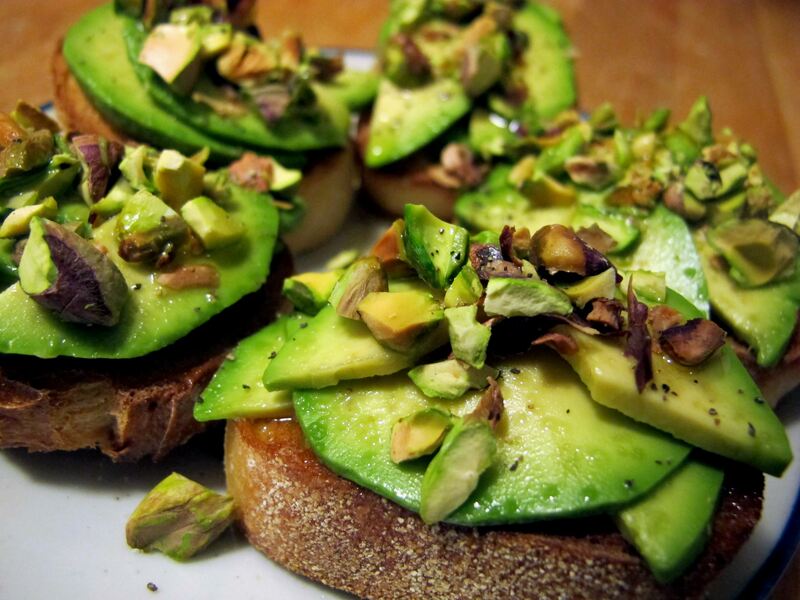 Without a doubt though, my favorite is the “avocado, pistachios, toasted pistachio oil, sea salt, grilled bread;” basically an avocado bruschetta. It’s easy to recreate and will spice up any dinner party or just bring a little something special to an otherwise bland, boring day. And I know, it’s high in fat, but you can make yourself feel better by the knowledge that avocados help prevent cancer and stroke, improve heart and eye health, control blood pressure, lower cholesterol, assist nutrient absorption, and have tons of folate, antioxidants, and vitamin E. Of course, we all know how great nuts are too. Toast the bread. Cut avocado into thin slices (you’ll want to layer them, so the thinner the better). 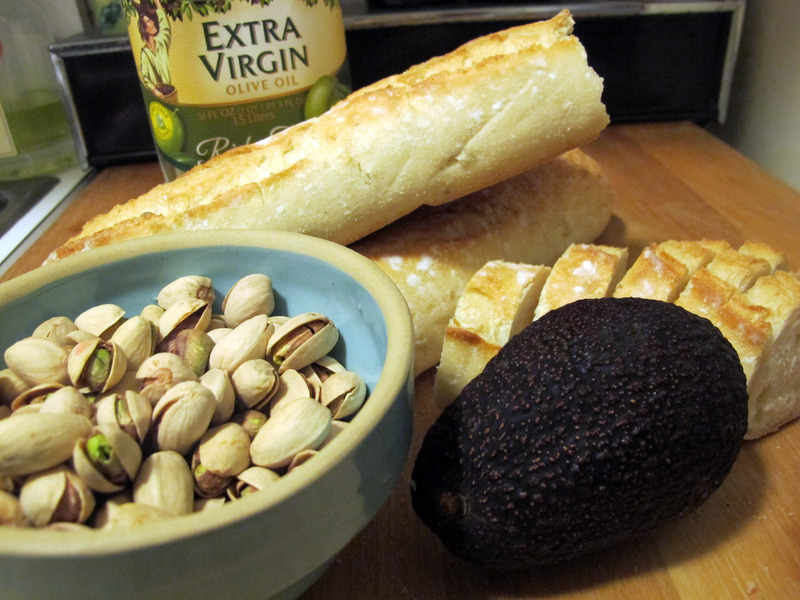 Chop pistachios into small pieces with the bread knife. 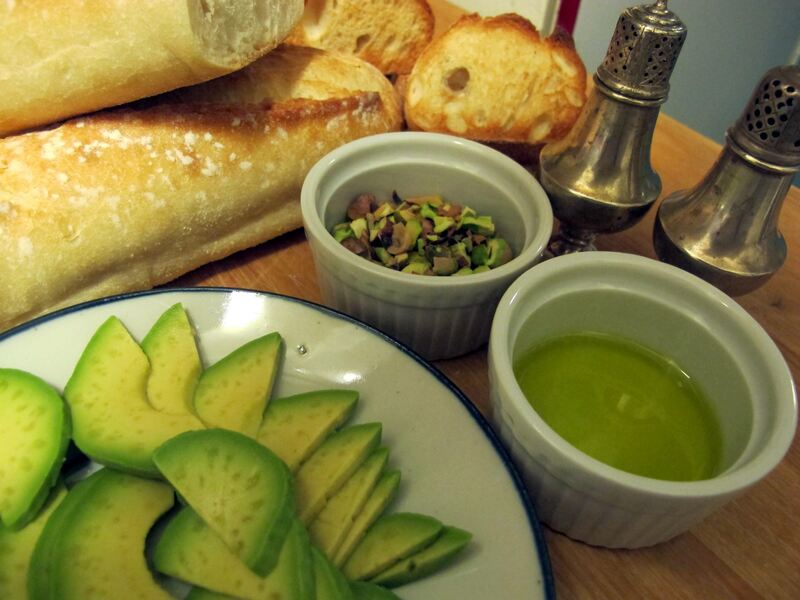 Once all of the ingredients are prepared, lightly brush each piece of bread with olive oil, layer a few slices of avocado, sprinkle with pistachios, drizzle olive oil, and dash salt and pepper. Delectable! This entry was posted in Delicious Recipes, Great Restaurants and tagged Appetizer, DC, Nuts, Snack. Bookmark the permalink. I will try this one!.. Looks very yummmyyyy..! I think I’ll try this with apple slices. Not as smooth, but I like apples better than avocado. However, not the same level of goodies that avocado provides, right? Except, “An apple a day…”. We’ll see!